Having grown up in Mumbai and always having had very friendly Gujarati neighbours , I have a long love affair with Gujarati cuisine and especially love the Gujarati Kadhi which was quite the star attraction in traditional Gujarati wedding feasts, always a sweet and welcome addition onto a plate full of steaming hot khichdi , the large red chillies added into for more the effect than the punch. If you don’t have access to buttermilk then simply use curd/ yoghurt. If using butter milk 3 cups this step is not required. Otherwise combine the yoghurt ,chickpea flour and 2 and 1/2 cup water till it becomes a smooth mixture. Use a fork or a whisk and if lumps are still visible just use your fingers to break the lumps. Grate a small piece of fresh ginger and crush a green chilli into it. On a medium flame heat the clarified butter in a large saucepan and add the asafoetida, mustard seeds , red chillies,cumin,ginger and green chilli and curry leaves. When the mustard seeds begin to pop and cumin begins to change colour, reduce the flame to a minimum , tilt the saucepan with one hand and pour the yoghurt and chickpea mixture into this tempering/tadka mixture. Add the sugar or jaggery now. Cook with lid on a low flame for about 6-8 minutes , do not boil as the yoghurt will curdle. Add salt and garnish with finely chopped coriander. 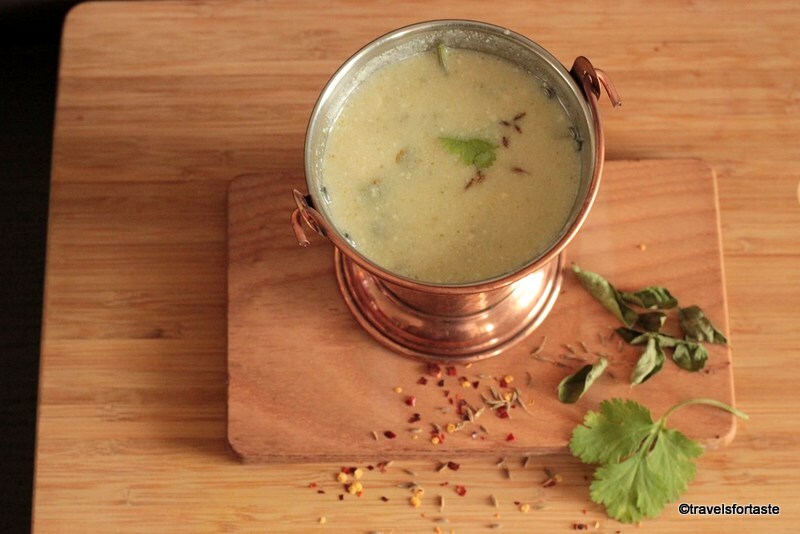 Serve hot with khichdi or soft rotis. 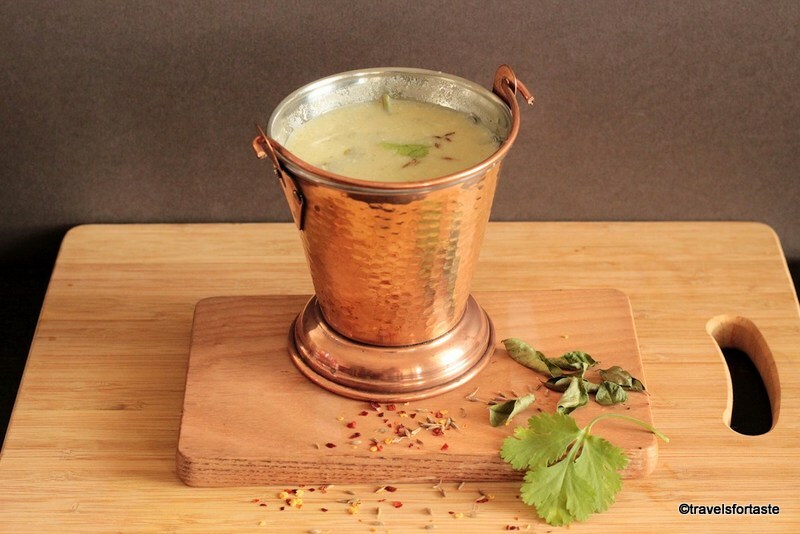 Gujarati kadhi differs from Punjabi kadhi in that it is sweeter and does not include fried pakoras, I have a fusion recipe for Punjabi Kadi which I tried long ago, if you want something a little different why not try my Punjabi Kadhi with a twist. I love Gujarati Kadhi too Manjiri.. But the sweetness sometimes is a bit too much, I usually skip Jaggery or just add a pinch of it for the taste. my mom loves them going to fwd your recipe to her, looks delish! Hey Ananda thanks a lot , this is a recipe my mother has handed me down after experimenting with Tarla Dala’s recipe, at times she just totally skips the sweet bit.Cheers! Yummy, your kadahi looks amazing. I love to eat, If its delicious I have to taste it. I’ll definitely try your recipe this week. I would love to check out your twist. Thank you Manjiri for sharing this mouth watering guju recipe. Thanks for your kind words of praise Raghav. I am glad you liked the post, do let me know how it turns out when you make it!